Putz Houses (those miniature Christmas village homes made of cardboard they sell just about everywhere during this time of year!) have always been one of my favorite things. My family’s holiday decor never included a Christmas village, which is probably why I’ve become so fascinated with them over the years. They’ve certainly become more popular (and less craft mom-y) in recent years. Martha Stewart had this incredible wreath made with putz houses on her cover last holiday season and DIY templates for the cardboard homes have popped up all over the internet. Still, when most think of a DIY holiday house, they probably think of a Gingerbread House, but I’m hoping that changes. Now, I love a chewy gingerbread cookie but hard gingerbread just doesn’t do it for me. And to be fair, I should probably disclose my recently established disdain for gingerbread with you. 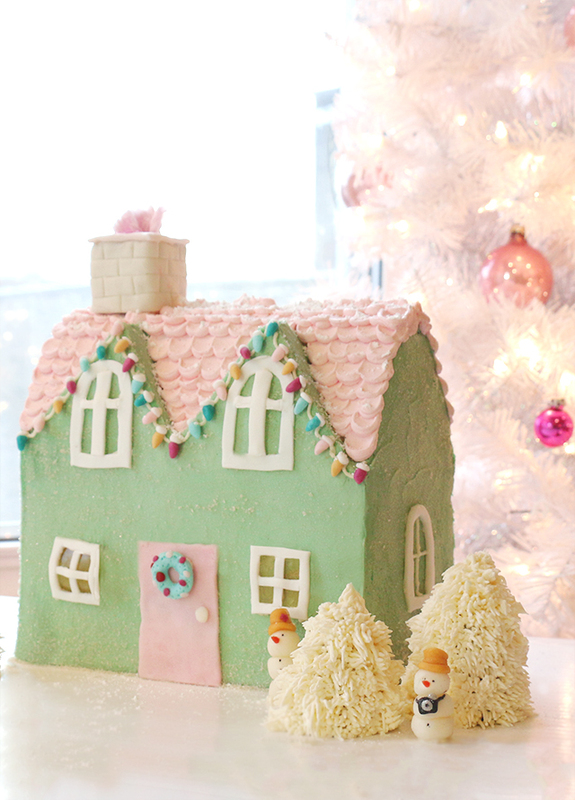 It all started last year when I I decided I was going to really go for it and make a spectacular gingerbread house. I spent a couple of days detailing the sides and roof of the home before assembling it and had meticulously planned out (and purchased) all of the candy decor I was going to use. Once my sides were dry, I assembled the home and added some additional details to the roof, before I decided it would be best to give the house a night to set (along with canned soup supports) before adding the final touches of candy. The next morning I awoke to my boyfriend leaning down over me with a very nervous look on his face. He softly said “babe, something happened to the gingerbread house last night…” By something, he meant that it had fallen in on itself and the icing had cracked, making it completely un-salvageable. Days and days of work for nothing. I was so bummed, but most of all, I had wished I would’ve made a cake instead because…well, cakes don’t collapse on you AND you can actually eat them. Plus, they give you a sturdy base so you can add way more decor than you typically would. So, with all that said, a holiday putz house cake is what I made this year. 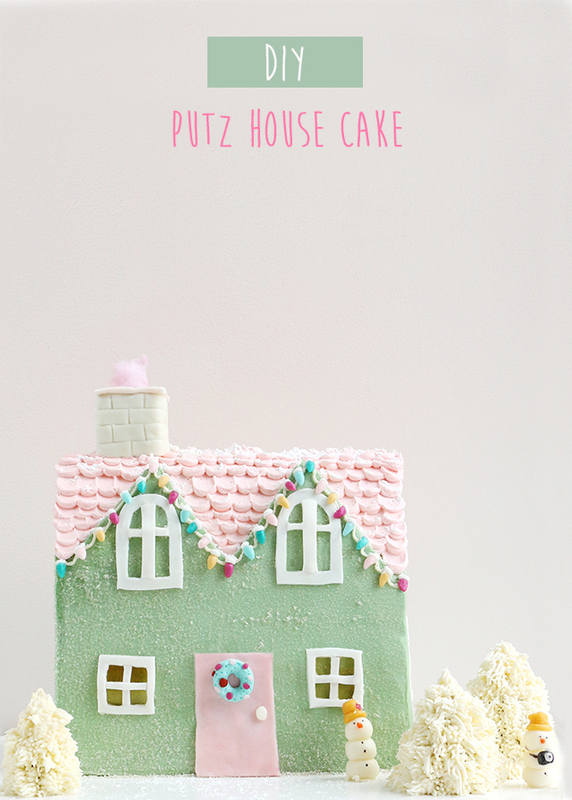 In hindsight, I can now think of a hundred reasons to make a cake house instead of a gingerbread house, but instead I’ll just show you how making a Putz House cake for the holidays is easier, cuter, and best of all, deliciously EDIBLE. Continue on below. As you can see by these un-styled and messy shots, I was in a bit of a hurry to make this, so please pardon the unappealing pictures. Directions: First, you’re going to need to bake 5 rectangular cake layers. 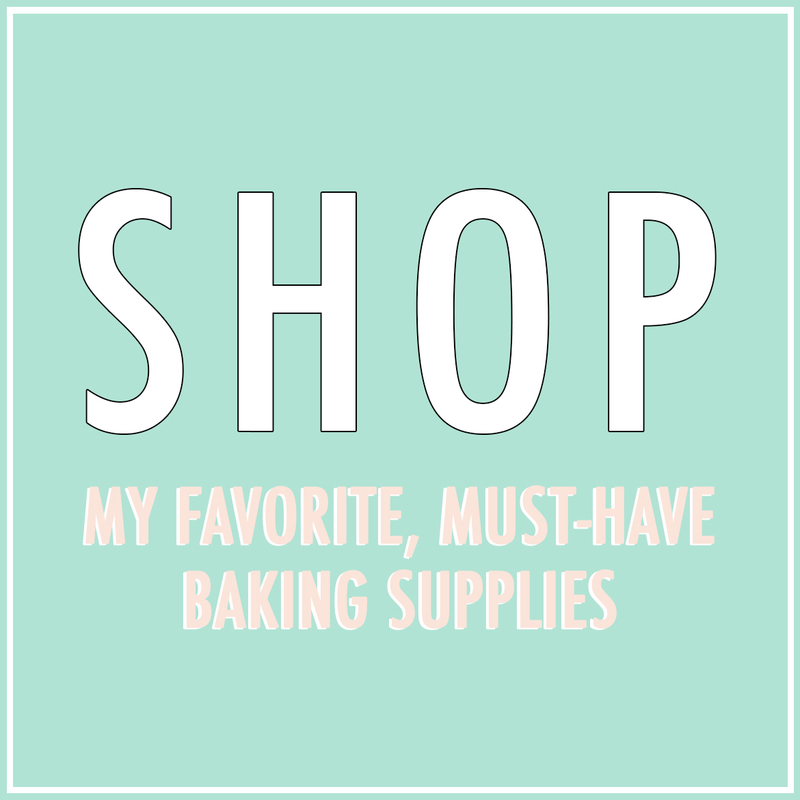 I used a loaf pan to bake mine for two reasons – first, I knew they’d give me a great rectangular shape and second, with a thicker layer cake the cake obviously takes longer to bake which means that once that center is finally baked, the edges will be ever-so-slightly overbaked. Now, that’s usually not good news, but with a house where I’ll be looking for extra stability, a strong edge is great news. 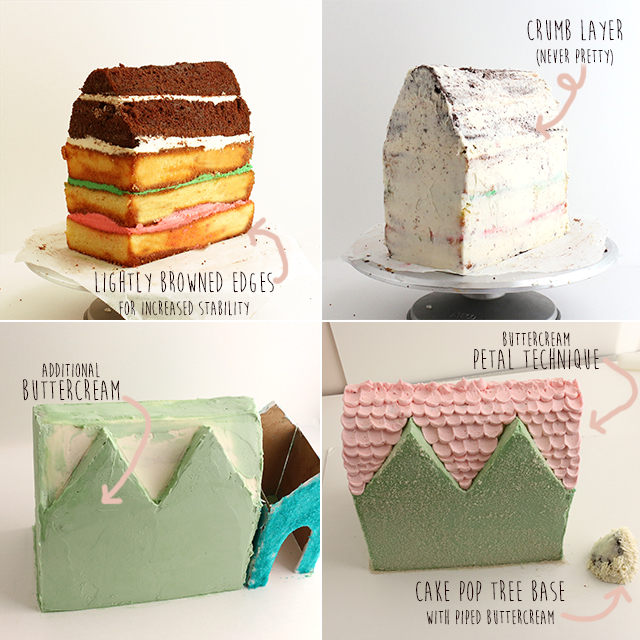 Once your layers have baked and cooled, stack them atop each other in between buttercream layers. Place in the fridge for at least 20 minutes to allow the frosting to set. Next, use a serrated knife to carve the layers so that the edges all line up cleanly. Carve the top two layers of cake at an angle to form a triangular shape (the roof). Set your cake carvings aside in a bowl. Using your spatula, add your crumb layer with buttercream frosting. This layer never looks pretty, so don’t worry about how it looks at this point. Set in the fridge for at least 20 minutes to allow the frosting to set. 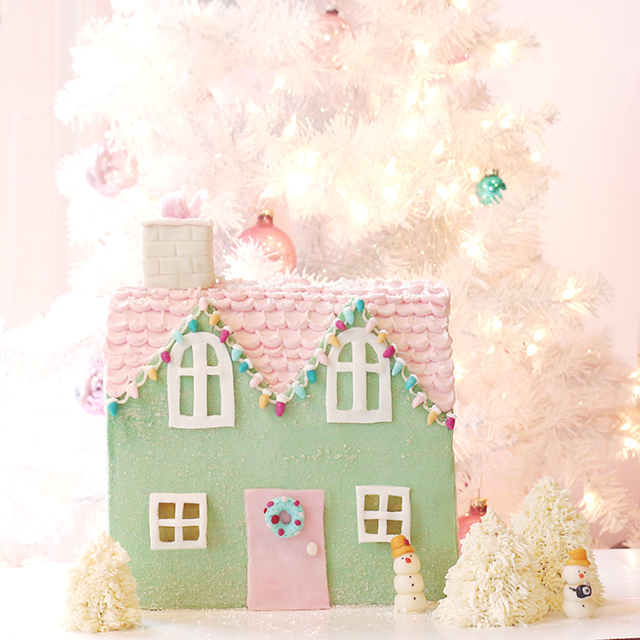 Putz houses are always coated in glitter, so I added a layer of sanding sugar atop my exterior layer of buttercream. 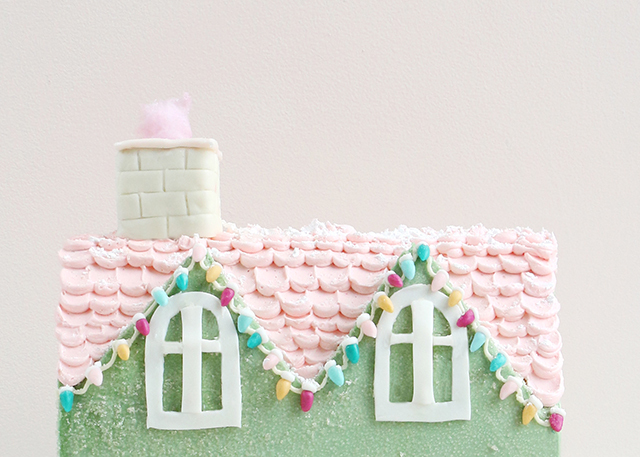 I then piped on the roof using the buttercream petal technique. If you’re unfamiliar with that process, THIS YouTube tutorial is great. For the trees, I broke down the cake carvings into small crumbs and then added a large spoonful of buttercream to the bowl and mixed to form a mold-able cake consistency (aka a cake ball!). I formed the cake frosting mixture into cone shapes and used a multi tip (#133) to pipe on the tree details. 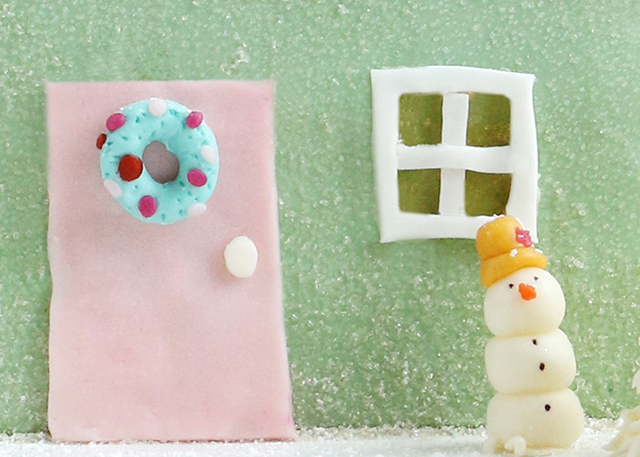 Additional details like the chimney, windows, door, wreath, light strands, and snowmen were molded from modeling chocolate. For the chimney smoke, I used pink cotton candy. 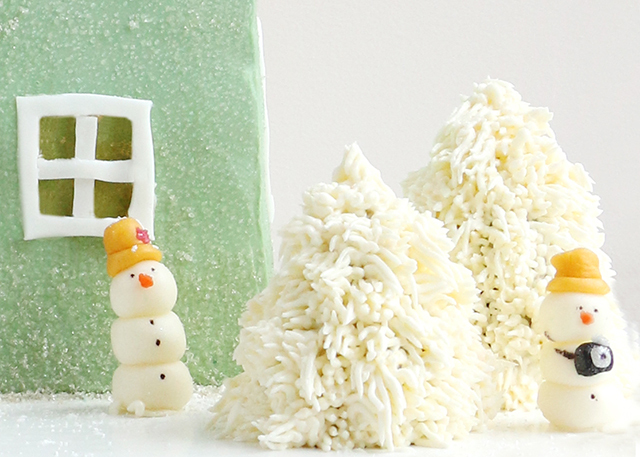 For help with those modeling chocolate details, check out my DIY Snow Globe post or my Christmas Caketus. 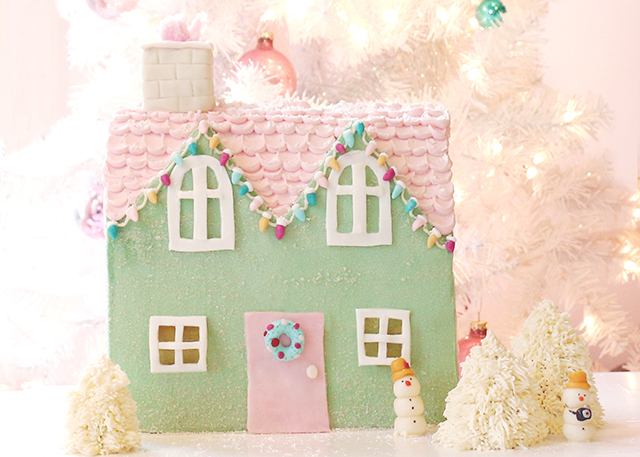 This is so genius (and MUCH more delicious than a gingerbread house that nobody will eat)! I love that you used a little tuft of cotton candy for the chimney smoke. Stunning!